In the distant future, mankind has lived quietly and restlessly underground for hundreds of years, subject to earthquakes and cave-ins. Living in one such village are two young men: Simon, who is shy and naive; and Kamina, who believes in the existence of a “surface” world above their heads. The destiny of these two starts moving drastically when the ceiling of their village falls in, and a gigantic “Gunmen” and a beautiful girl named Yoko, wielding a superconductive rifle, come from the surface. 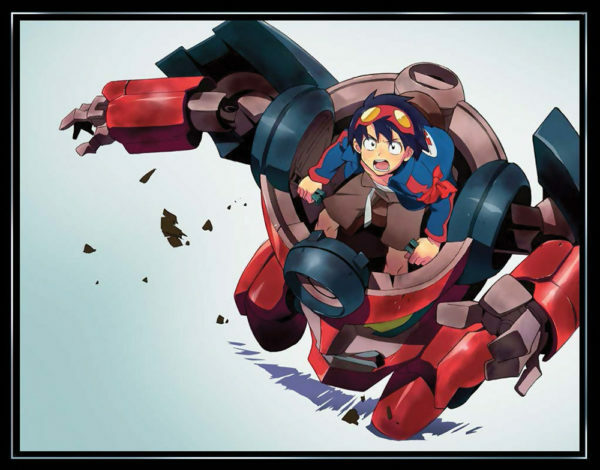 Together, Kamina, Simon, and Yoko ride the mecha “Lagann” that Simon digs out of the ground, and fly up to the surface! Contains episodes 1-5 plus a double-sided poster and a 16-page booklet featuring creator interviews and an illustration gallery! Special Features: Textless Opening and Ending, Episode 5 Preview (On-Air Version). Be the first to review “Gurren Lagann Blu-ray 1 (Hyb)” Click here to cancel reply.